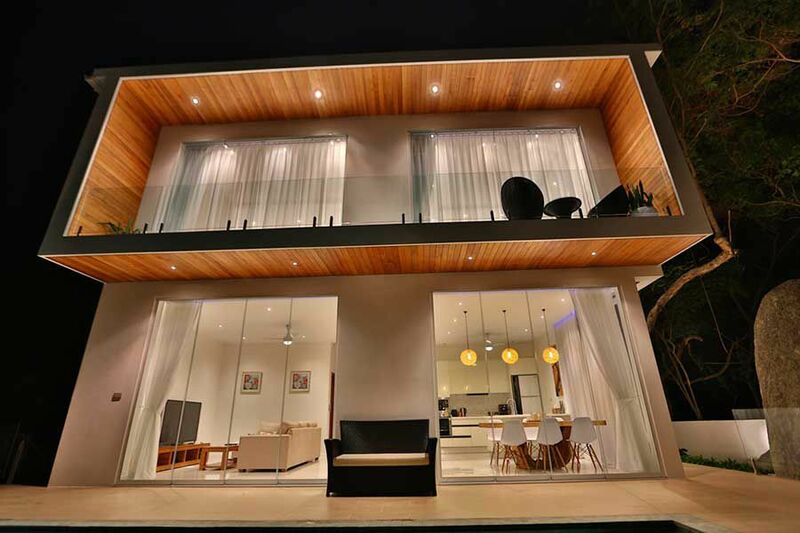 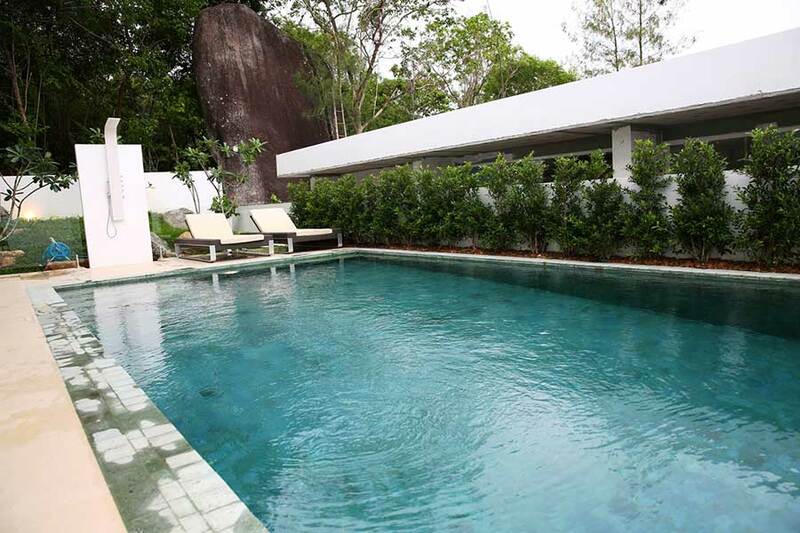 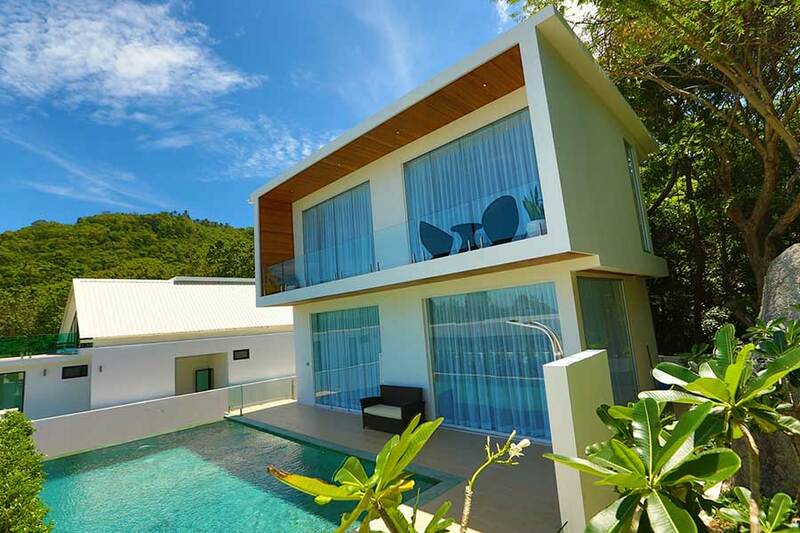 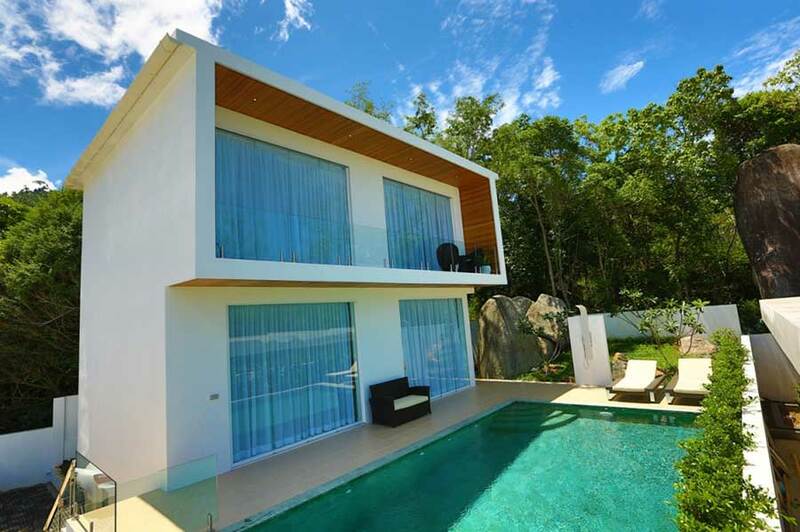 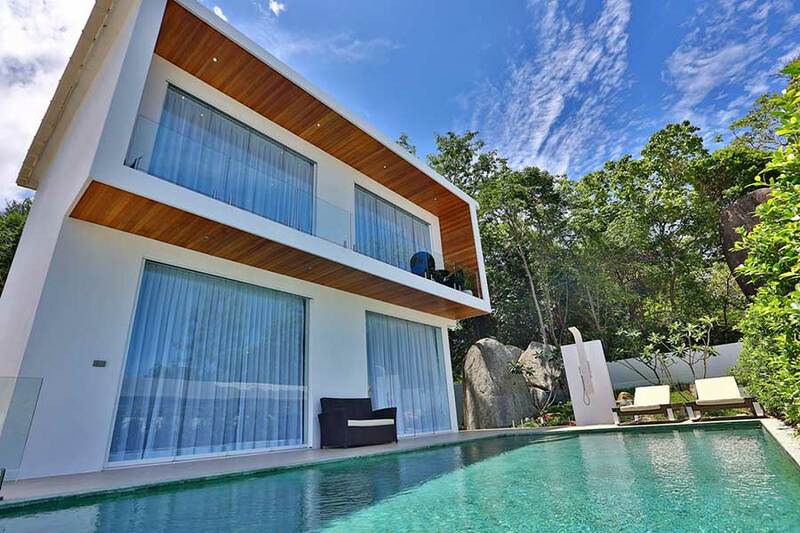 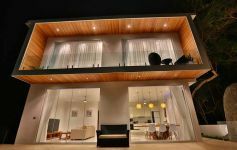 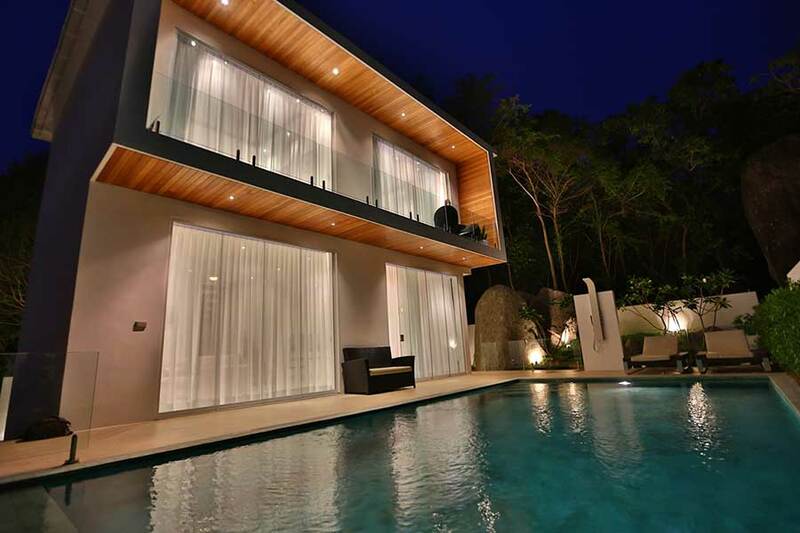 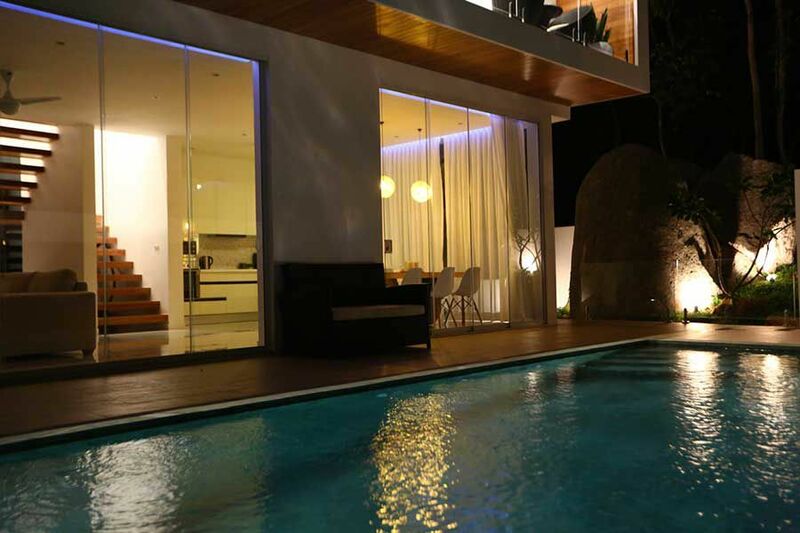 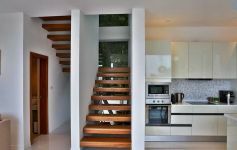 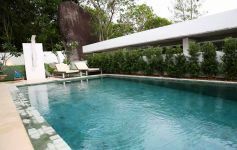 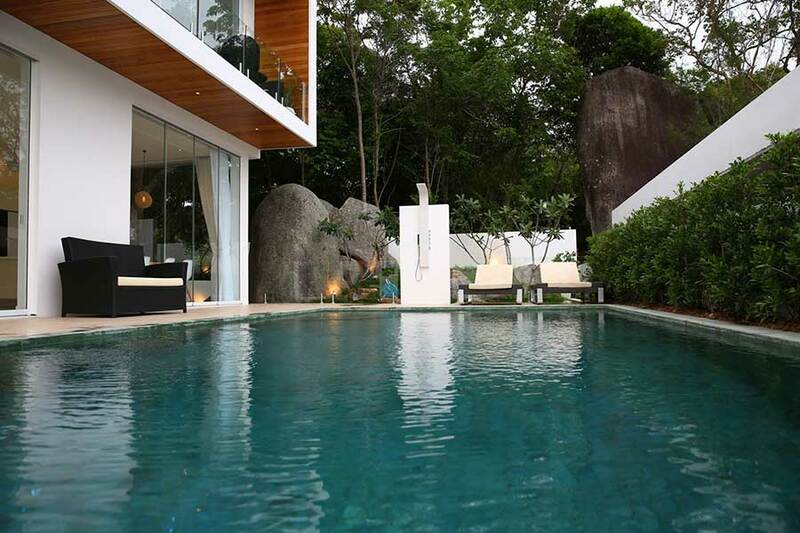 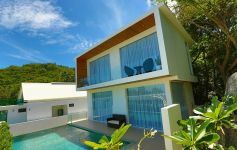 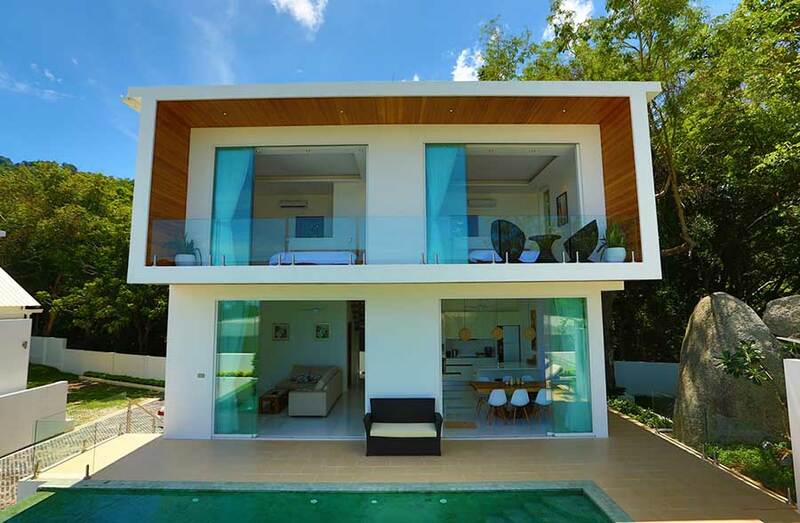 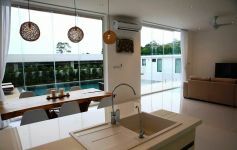 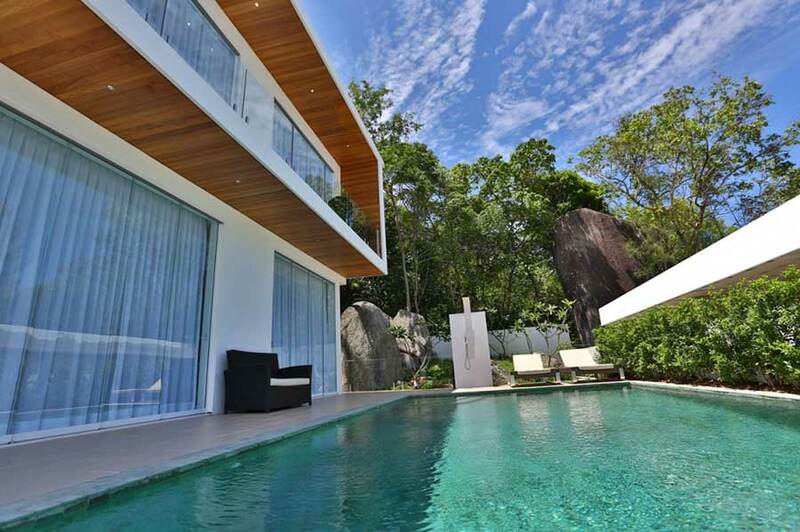 This exquisite villa is located in a secluded part of Koh Samui’s south coast near Lamai Town, far from noisy roads and just a walking distance from the sea shore. 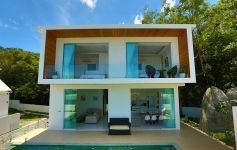 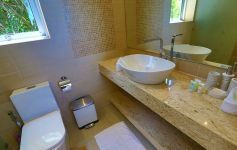 The two-bedroom villa features a private pool, a terrace fitted with a barbecue, sun-beds, and tropical outdoor shower, and a private garden. 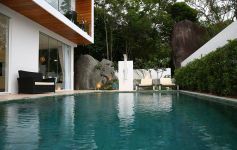 It is the perfect place to while away your days enjoying tropical bird song and Samui's natural environment. 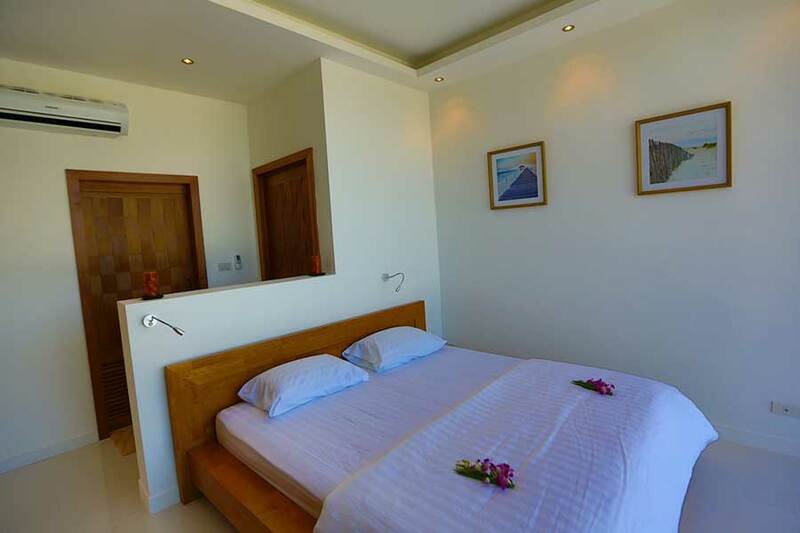 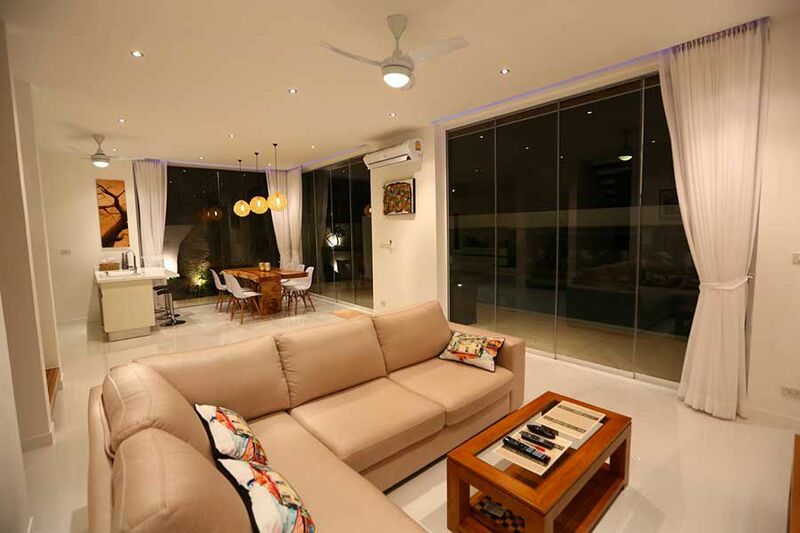 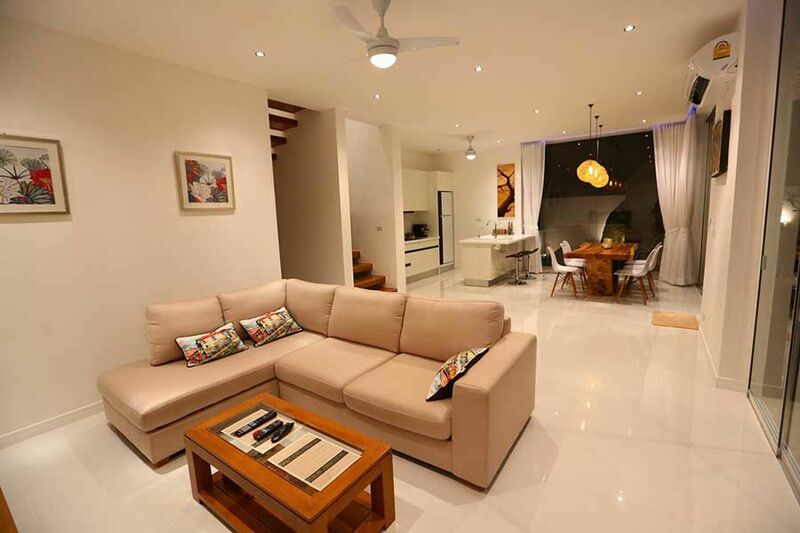 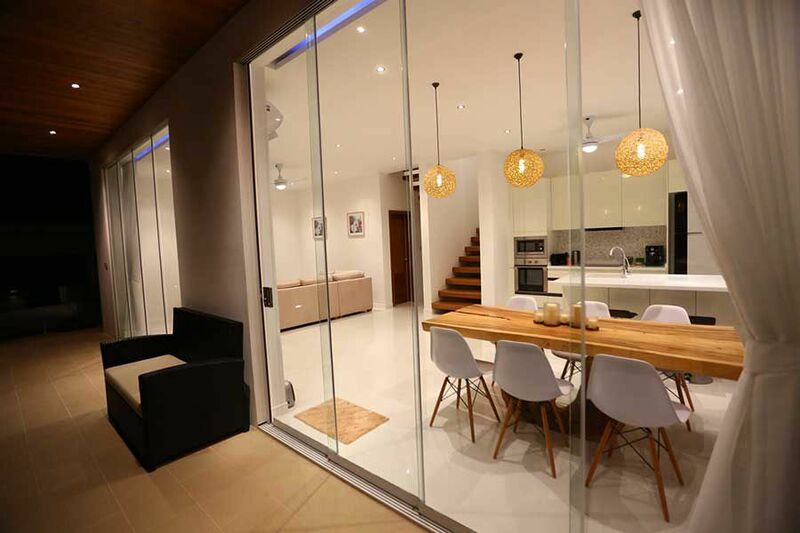 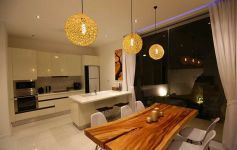 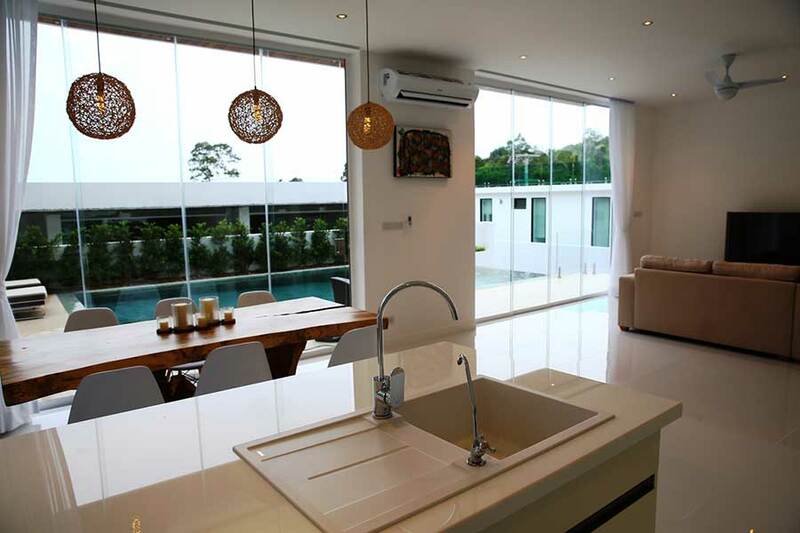 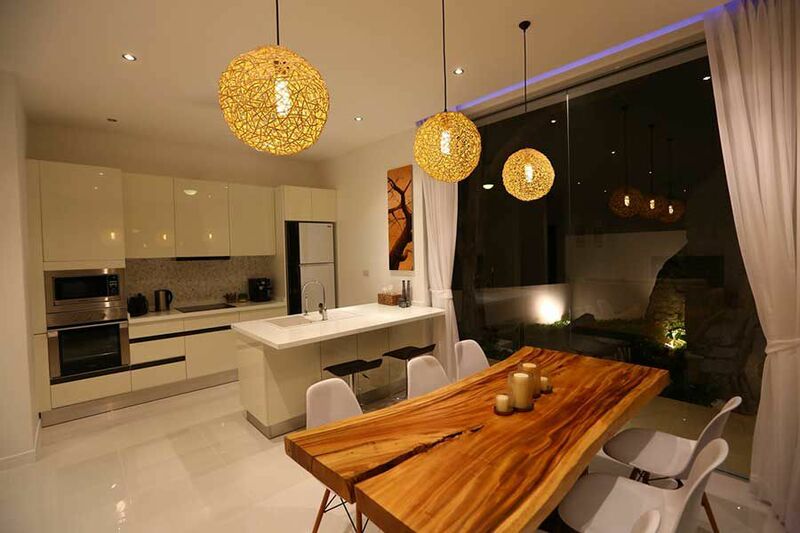 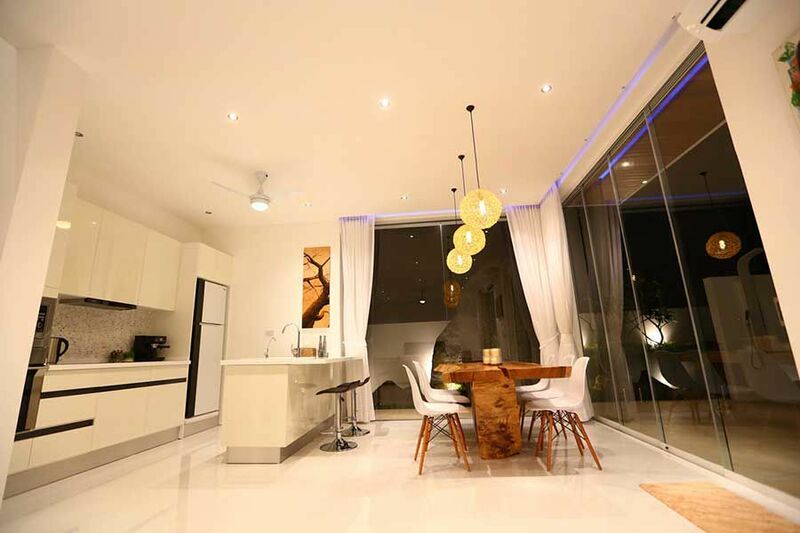 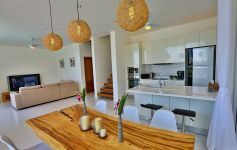 The first floor of the villa has a comfortable living room combined with a modern kitchen. 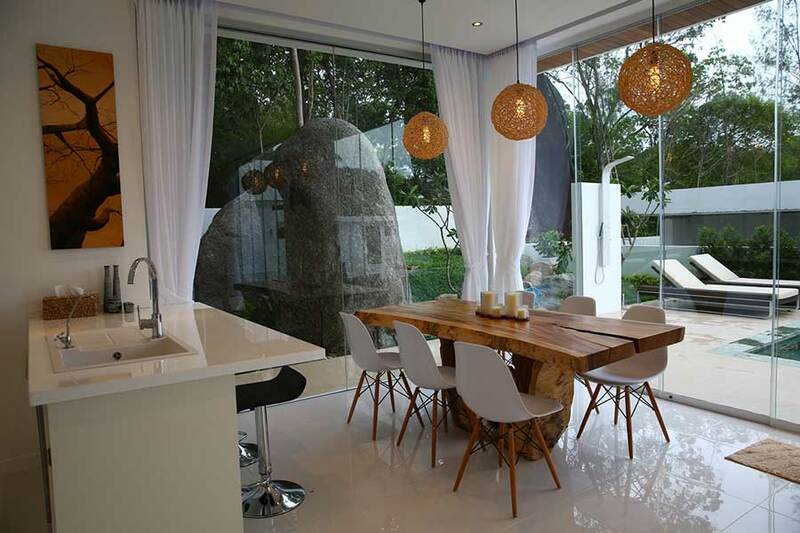 The interiors are in pastel shades with bright accents. 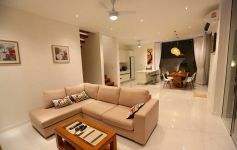 The living area has a comfortable sofa with colourful decorative cushions in front of a large TV (with a smart TV option, Internet access and cable TV with international channels). 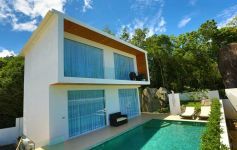 High-speed Internet covers the entire villa. 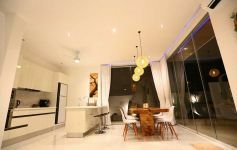 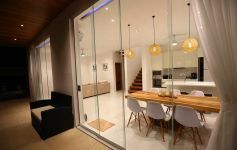 The modern kitchen is fitted with a stove-top, oven, dishwasher, high-purity water filter, fridge, coffee machine, kettle, toaster and much more. 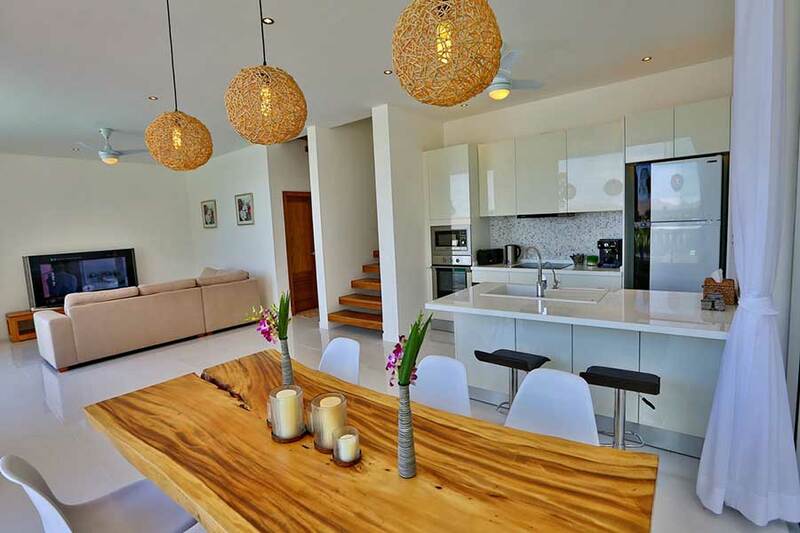 There is a wooden table next to a counter-top. 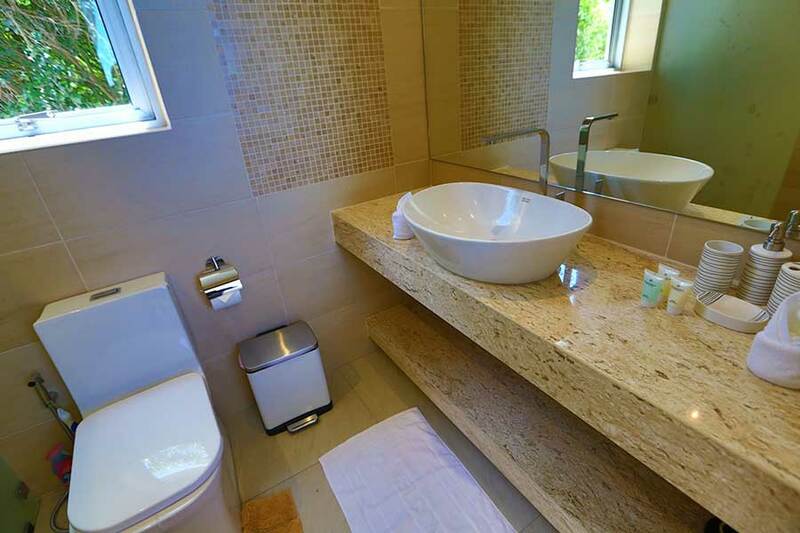 This floor also includes a guest bathroom with a washing machine. 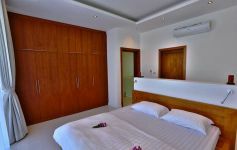 The top floor has two bedrooms, each one with an en-suite shower room and spacious wardrobes. 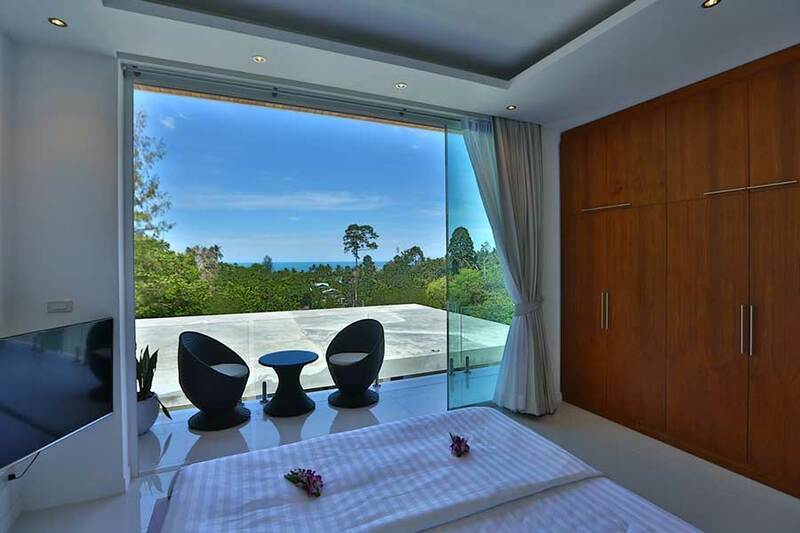 The bedrooms have lovely sea views. 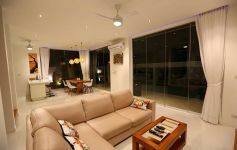 The balcony has a coffee table and seating for two. 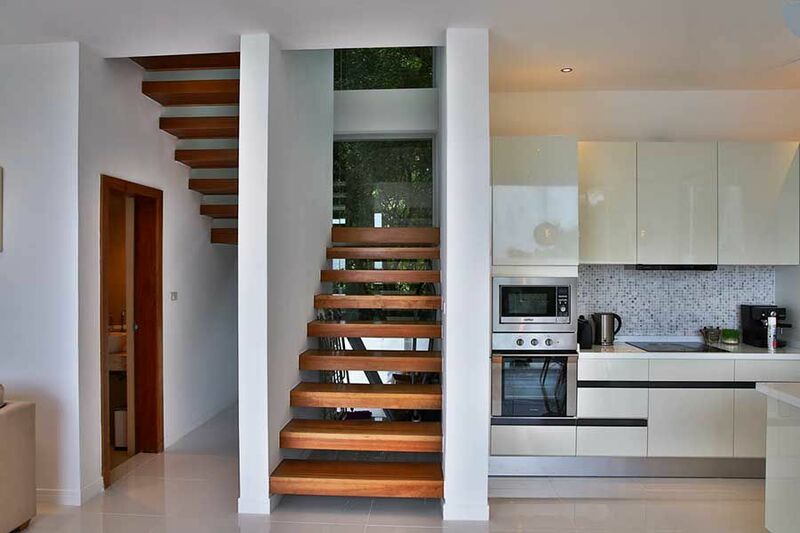 Large windows opening onto dense bush adds a tropical feel to the staircase landing between the first and second floors. 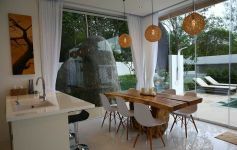 Large windows around perimeter of the villa create a seamless link between the interior and the delightfully verdant tropical outdoors. 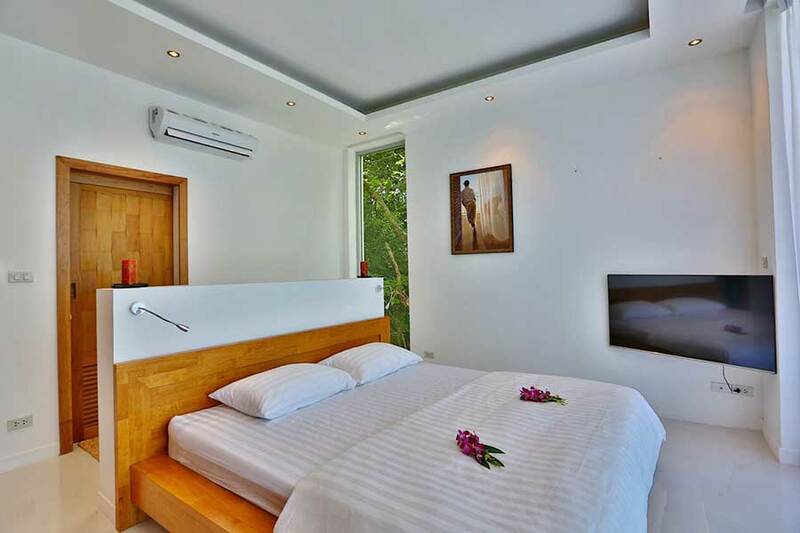 The villa has a safe, an iron, a hairdryer, air-conditioners and a parking lot. 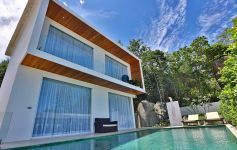 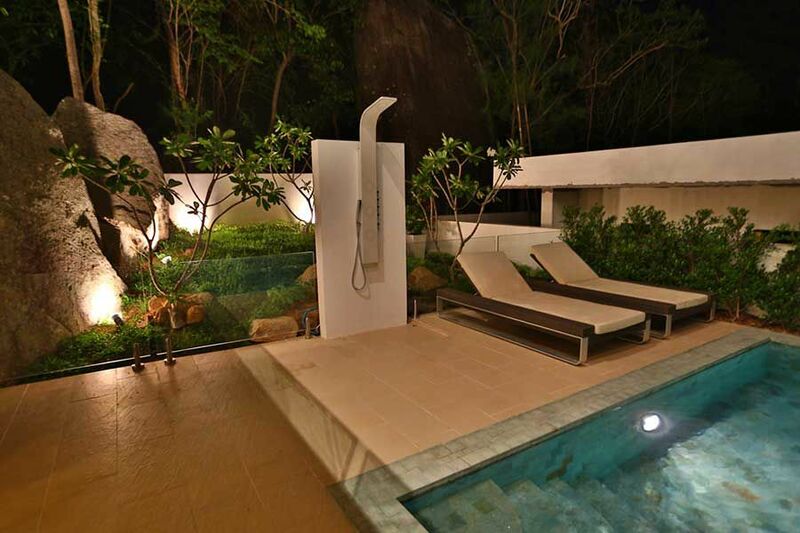 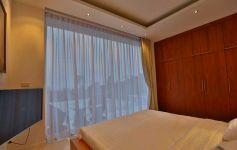 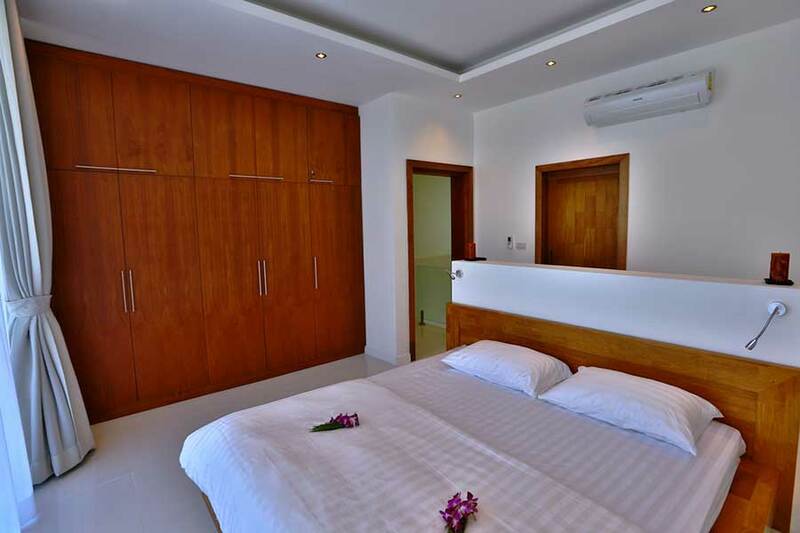 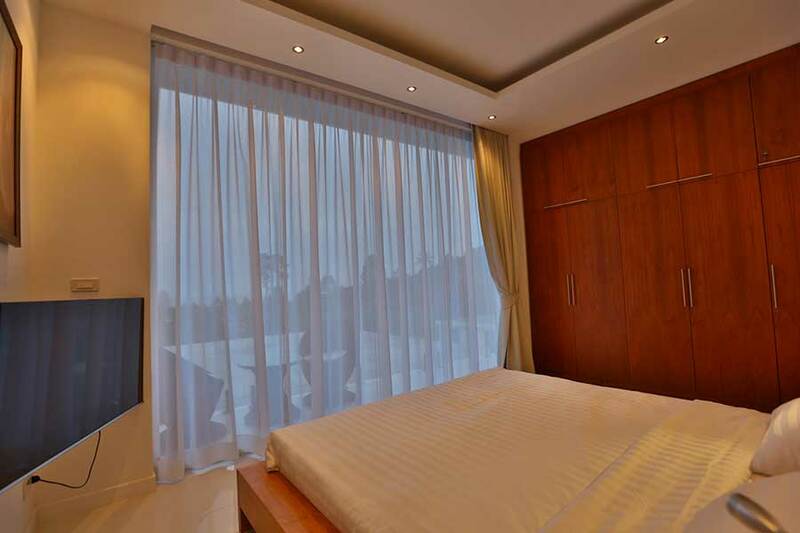 It is only 4 minutes to Lamai beach and Tesco Lotus and Makro supermarkets are only 1-2 km away from the villa.